Just a quick post today but I wanted to show you some of the items that can be found from Handverk at The Arcade. 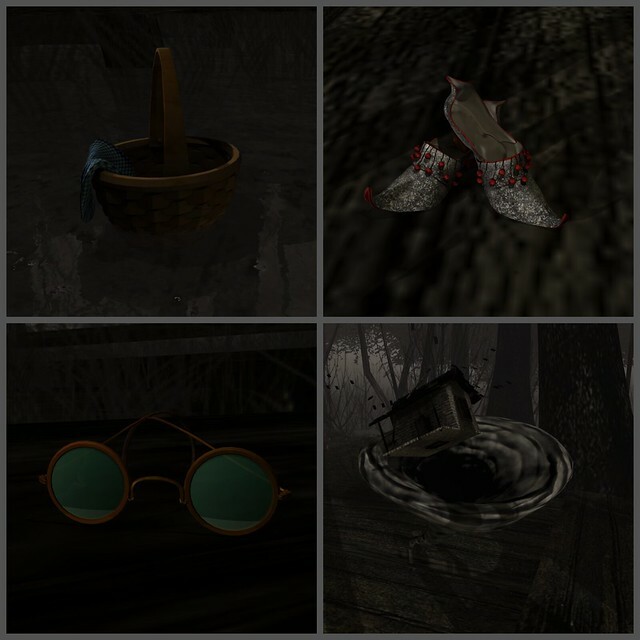 Their items from the gacha are based on the original children’s novel, The Wonderful Wizard of Oz, written by L. Frank Baum and published in 1900. I caved! I got one of the doll heads from Fashionably Undead for the Arcade! This is definitely a lot different from my normal look but I kind of like it and think I look rather cute :p. What do you think? Don’t you love it when two unrelated creators released two different items for two different events that just GO SO WELL TOGETHER? That is how I felt this weekend when the Arcade Gacha Event + The Whore Couture Fair (unfortunate name) started. The Secret Store have released these awesome retro Roller Skates for the Arcade and Sakide’s release for the WCF are these awesome Disco Shorts. I couldn’t help but wear them together! Doesn’t help that I’ve had this song in my head ever since. I blogged again.. go me! Feeling oddly inspired tonight! The Arcade is a new gacha event that if you are lucky enough to be able to TP in has some REALLY amazing items available. My faves so far are the Auxillary Mouse Ears and the Glam Affair Skins. The title of the blog post comes from the AWESOME marquee letter signs from [Commoner]. I had to get my own letter !